Automotive prophets forecast a new type of home – on – wheels for the modern outdoor enthusiast. WHAT is the house trailer doing to the automobile? How is the automobile to look after it has been revamped by this new and increasingly popular vehicle of personal transportation? Will the motor car combine with the trailer to create a “touring and living car”—a car that we might call the “Trailmobile” or some other appropriate name? These are questions that are spurring the automotive prophets on to new heights. Many highly visionary ideas are being advanced; but even the most casual observer cannot help but note that the automobile is well on its way toward being made over to fit the new trend in personal travel. Many engineers believe it is not improbable that within a few years the car and its trailer will become a single unit, the new craft embodying all the comforts and advantages of each vehicle without some of the present disadvantages. In this process of the tail wagging the dog we cannot help but be impressed by the astounding lack of comforts and conveniences in the automobile itself. You can’t even get a drink of water from a car, even though there may be five gallons of it circulating around the engine. This water is so restricted in its process of cooling the engine that there isn’t any convenient point where you can use it to boil an egg. The reverse of all this is the marvelously compact and convenient house trailer which helps to focus attention on the lack of even the bare necessities of long distance travel in the car itself. On the horizon there are some broad hints of the new vehicle which should emerge from the present situation. One is the increasing interest in larger generators for the automobile. It has been possible for some time to have installed a 110-volt generator which can be brought into action by engagement with the fan belt. While the engine is running, and at a cost of the small amount of fuel consumed in idling, it is possible to generate enough current to light a tent. This current is also sufficient to operate several electrical devices of the home type, thus paving the way to greater convenience for the tourist. sengers can lock themselves in their car when sleeping, or if they prefer extra ventilation for summer camping, they can lift up the cover of the luggage compartment in addition to opening the windows. Cooking by automobile has frequently been done via the pressure system, a special cooker being attached to the exhaust pipe. While passengers tour their dinner is being prepared for them. Such an accessory has at least served to prove what can be done with the great surplus of heat that is wasted along the exhaust line. The hot air “stove” for the carburetor and intake manifold has served for many years to improve the carburetor mixture, but why not include a stove on which a tourist can cook a simple meal? tired, which is attached to the under side of the chassis. Its purpose is to supply the extra current needed to operate amplifiers and phonographs. It is but a short step from this to a fifth wheel which can be dropped to the road from the touring car when extra current is needed. This current will be stored for further use when the car is parked for the night. One such auxiliary generator has an output of 20 amperes at 20 miles per hour. added a small fan to the generator to keep it cool while turning out a little more current to keep the battery up to par when lights, radio, heater and other electrical devices were being operated simultaneously. This was considered an achievement, little consideration being given to the fact that for years engineers have effectively cooled a much more difficult unit—the engine itself. Fans, defrosters, heaters and other incidental equipment of the modern car are considered as marked advances in comfort, but by comparison with the improvements in the mechanical design of cars, developed as an essential to performance and efficiency, they are almost in the toy class. 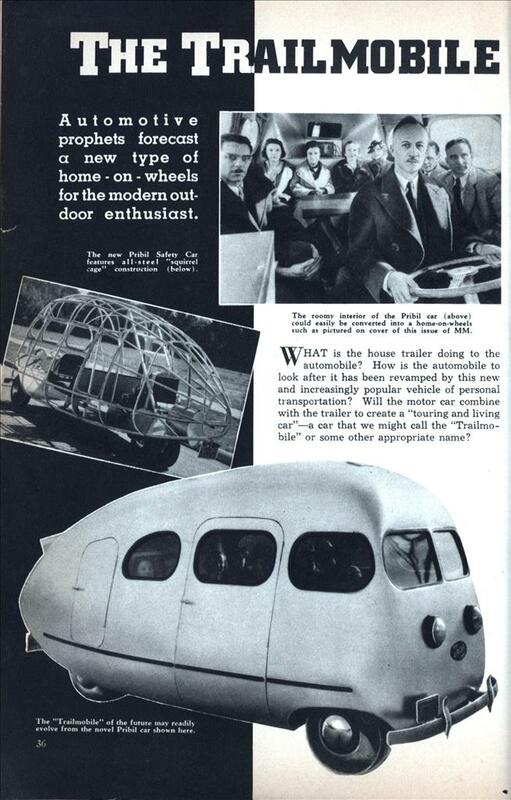 As the motoring public becomes accustomed to the real comforts of the house trailer they will be aware of the present lack of even the barest necessities in equipment in the car itself. The logical step will be for the motorist to demand such comforts in his car. Such improvements can De had. It is just a matter of the motor tourist stopping to ask himself, “Why not combine the trailer with the automobile?” That might provide a means of escaping many restrictions which are being placed on trailer use by the various states. It should cut operating costs as well as the initial cost. Three hundred dollars added to the price of the average car, in return for the conveniences needed to make it more liveable, would be cheaper than attaching a trailer, and much more convenient. from it all” until the automobile is designed to stray further from the beaten track without causing its owner constant worry. When these changes are made, naturally engineering ingenuity will go the limit. The real American touring car will be the result. This all-in-one vehicle will carry permanent jacks so that to raise the car for a tire change or brake adjustment it will be necessary merely to touch a button on the instrument panel. Permanent jacks, mechanically operated, have from time to time appeared on the accessory counter. They failed to make headway because the motorist felt he did not need them. “I’ll just call up the service station,” he assured himself. But now that he strays far away in the trailer he knows how important the jack has become. He will want jacks “all around” on his touring car of the future, and—he’ll get them. did the motorist realize to what extent he could “live” on the road. Naturally he did not notice until this time just how much he had lacked in his automobile. There was a hint of housekeeping on wheels when the closed car first made its bow, if you recall the cut glass flower vase which was considered essential to the well-appointed sedan. Today things have reached a point where anyone who goes touring in the high, wide and handsome manner of the hour expects to be able to have all the conveniences from cracked ice for a Tom Collins to hot water for a shower. Heating is unnecessarily deficient in the average automobile. It is dependent largely on a cooling system which normally operates at too low a temperature. This, in turn, is due to use of oversize cooling systems to compensate for the average owner’s negligence to have things kept in good working order. Exhaust heat is completely wasted. Once it was the custom to harness it for heating purposes, but the fear of leakage of carbon monoxide has retarded progress with this type of heater. Leakage can be, and is, prevented through the use of better materials and more effective fittings. As a matter of fact, the exhaust can be used for indirect heating, using air or fluid as the medium. This is the principle of the steam heater which is growing in popularity. Refrigeration in the automobile can be either gas or electric in operation. There is much experimentation still to be done by way of cooling with exhaust gases, and engineers have by no means given up the idea of reviving tanked gas which on earlier cars furnished fuel for lighting purposes. The electric refrigerator of one of the latest trailers is battery operated, there being a special battery charger for use when the trailer is paying a visit to a camp offering current service. One of the straws in the wind is the current announcement of a new replacement generator for use on all passenger cars. It is capable of delivering 28 amperes when required by the battery or by the connected load. The next step will be the offering of much larger batteries so that there will be a reserve of current for a variety of purposes. In the picture of the future touring car the dash will become a “convenience board.” Not just clocks, gauges and the mildly useful glove compartment, but a thoroughly efficient “counter” on which, when folded forward for action, the driver and his companion can treat themselves at least to a simple roadside snack. Lacking actual mechanical refrigeration, the food will at least be kept cool and fresh with the aid of dry ice. There will be an electric coil to heat water, or to warm up a can of soup. If the engine is switched to the rear of the car there will be all kinds of room ahead of the driver for storage space in which to locate these various conveniences. The car itself will also be very much redesigned so as to make it more homelike and to permit the use of things that go to make the modern trailer what it is today. We have a broad hint of this in the chair-type seat which has replaced the conventional automobile cushion on some cars. There is no reason why the steering wheel should protrude into the driving compartment when the driver is using the car as living quarters. Something on the order of the folding wheel which once graced earlier models of high grade cars would be just the thing. For that matter the wheel could be designed so that it could be removed temporarily, the post being folded up and out of the way. buses pipe the exhaust gases to the rear top instead of having the fumes emit low to the ground. This is the beginning of the chimney idea in the touring car of the future. Unquestionably the great annoyance which a puncture can cause with a trailer is going to encourage the development of stronger tires. Puncture-proof inner tubes will come into increased use. Whatever the motorist finds desirable in a trailer he will shortly want in his own car. Just one of these things is element-proof construction and finish. Trailers are essentially outdoor vehicles. They seldom enjoy the protection of a garage. The public welcomes compactness. It is one of the appealing features of the trailer itself. But since a trailer is of little use without something to pull it, the public is beginning to wonder why it is necessary to have two vehicles to do what one more compact craft could provide. From this reasonable “why” may come one of the most tempting products ever fashioned by the automotive industry. itself, not merely the thing which provides propulsion for the trailer that follows, but a very complete means of highway living itself. MODERN MECHANIX Believes That—the only answer to growing anti-trailer legislation is a better, more sensible home – on – wheels. 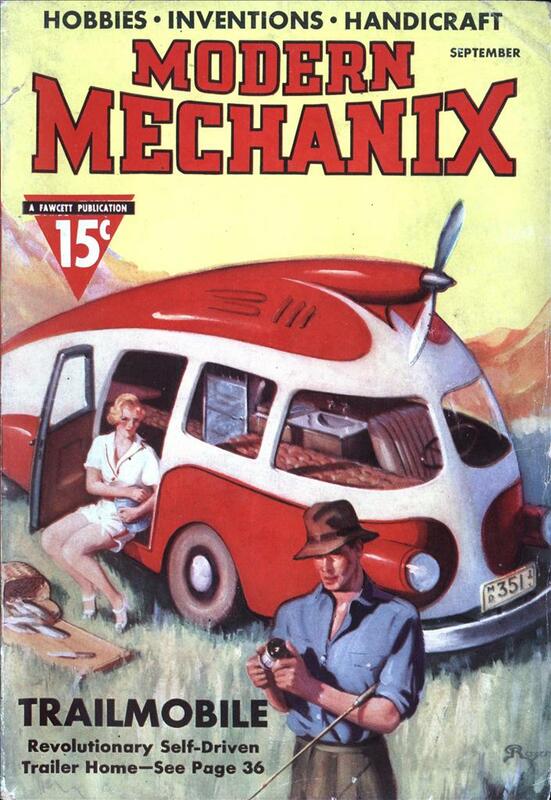 Some pioneers have already experimented with the “Trailmobile” idea pictured on the front cover; we think that the construction of such a real “touring car” could readily be undertaken by any home craftsman. A single unit trailer— home of this kind appears to be much more practical than the unwieldy combination of an ordinary automobile and a big van hanging on behind. Eliminated will be such pressing problems as double brakes, extra axles and tires, unreliable hitches, poor acceleration, zero rear visibility, difficult steering and parking. Would you, as a present or prospective “trailer” user like to see plans for building an actual “Trail-mobile?” Will you help us design the trailer-home of tomorrow by sending in ideas that you think should be incorporated in it? Set busy with pencil and paper, and let’s make a vehicle that will be welcomed in any community instead of being chased away! Camper vans did exist before this – a book I have about steam on the road describes a steam-powered one, which naturally had a good supply of hot water for the shower – but apparently in 1938 they were almost unknown, which surprises me. The proposals to generate electricity by trailing a wheel with a generator on it, or using “wind”, would slow down the car and waste fuel. Modern campers tend to do without until they reach the camp site, then plug into the mains. HA! I love the Trailmobile, it looks like a bug! Stephen I thought Campers were more known back then too, but in 38 the depression had been going on for years so mabye there had been no incentive for them? And it shall be known as an RV – a Revolutionary Vehicle!